The second round of experiments with yeast are done. 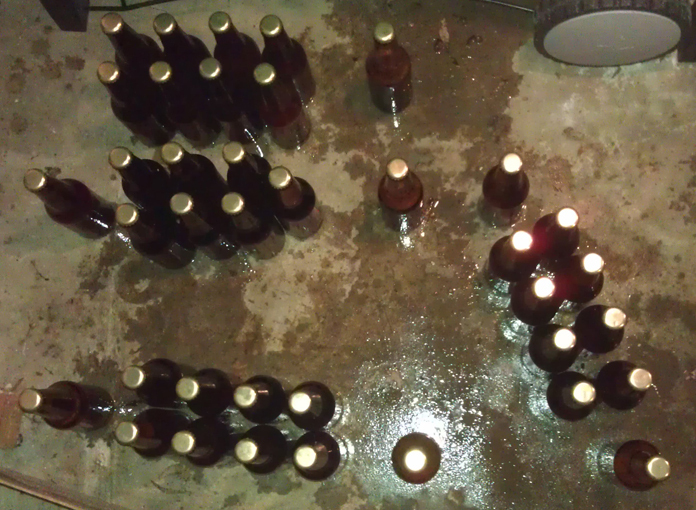 Over a couple evenings in the last week I bottled the Pale Trial Zwei. From the first impressions it looks like the yeast characteristics from Pale Trial Ein have carried over. There’s a strange tart and dry-sourness, especially from the first carboy. 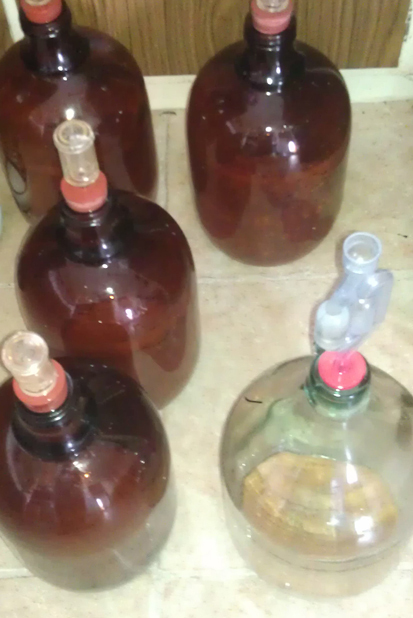 Carboy 2-5 were bottled on a septate day, so I can’t do a five-way comparison. The good news is that the Galaxy hop flavours have come out well. There hasn’t been the big bitterness that I was getting with the Victoria Secret hops. Nice tropical aroma and flavour at the front. One these condition for a few weeks they should be good for the spring sun. The one thing I really wasn’t sure about was how healthy the yeast might be. I didn’t know if there would be too much yeast, grown from the last batch. Maybe it wouldn’t be healthy enough, stressed from the last brew. Or maybe it would need more nutrients, which I deliberately didn’t put in. Plus I didn’t keep an eye on the fermentation. That said, it looks like things went smoothly. Final gravity readings ranged from 1.010 to 1.008 and I’m happy with that. The OG was 1.047 and after bottle conditioning alcohol should be between 5.6% and 5.4%. That’s very respectable for a pale ale. The cause for the range in final gravity may have been due to a few things. Possibly sediments in the sample, possible yeast health, or a number of other things with the yeast. The bottling by myself was a bit of trial and error. The first carboy I used the old hand siphon. That is, two tubes with a pump thing. Have been using it for a while but works as long as you’ve got the flow going and don’t stop-start too much. For the rest (done on another night) I was able to use the Auto Syphon as the other carboys have a bigger opening. Had a bit more trouble with this due to the seal between the top and the tube. After a lot of trial and error I worked out better to pull the end out of each bottle and fill the next without trying to stop the flow. Lost a little, but not as much as stop-start. Something to work on. In an attempt to try and reduce beer loss, I left beer in the Auto Syphon between carboys, so mixing left over from one with the start form the next. Bottles marked, but not expecting anything noticeably different. Looking forward to trying these brews. I’ve had a bottle of each of the Pale Trial Ein bottles. They’ve settled down a fair bit. I didn’t do a side by side comparison, but the differences seam to be there. Will do a proper review in a week or two. Been a bit slow getting new content up. Few reasons for that. I’m letting my fermentation times run a bit longer, like this one for three and a half weeks. I’m brewing less, next one in a few days. Chas isn’t brewing, he’s got a bit of a stockpile. But might be fixing that this coming weekend. And a few reviews haven’t gone up yet. I’m going to try and get a few of them up over the next couple weeks. I’ve talked to a fair few home brewers over the last two years. Pretty much all aspects of brewing have been discussed. One thing that comes up every now and then is the use, growth and reuse of yeast. Something I’ve mostly avoided, until now. Since day one of homebrewing I’ve used dry yeast. And, up to only earlier this year I’ve pitched it into the wort dry. Since then I’ve done some rehydration of yeast. 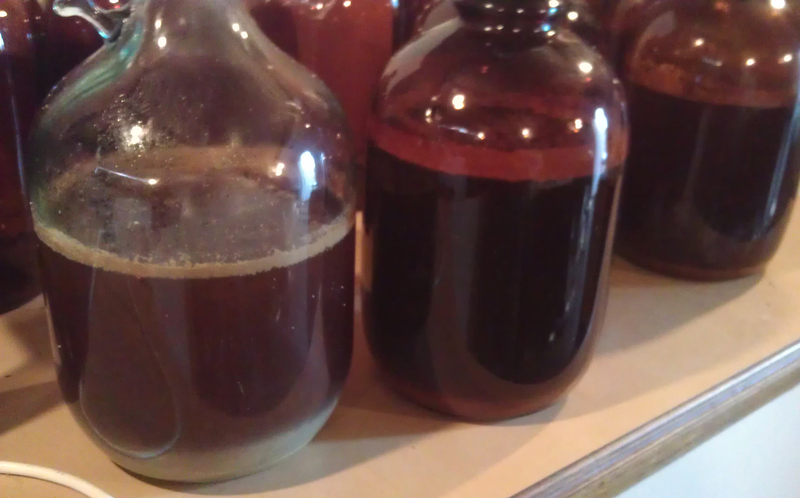 And even a couple basic yeast starters. Nothing serious. Off the back of the Pseudo Lager I wanted to capture that yeast. It was a basic US-05 yeast that did what it shouldn’t have been able to do. 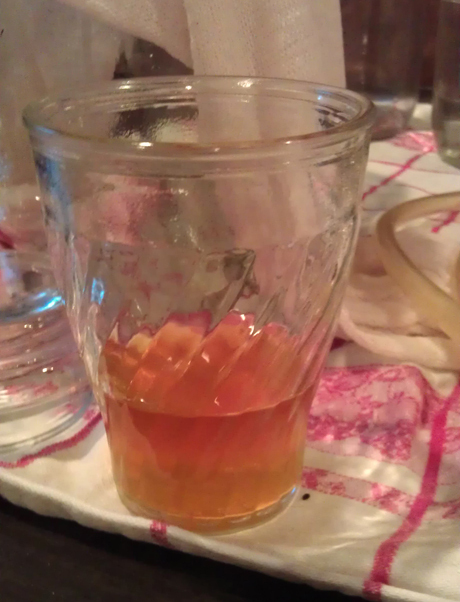 It took a strong pale ale extract brew and brought it down to a low 1.006. That’s around the lowest I’ve ever got a final gravity. But what was exceptional was that it did it over a period of a month. All the while temperatures ranged from as high as 14°C down to 0°C, maybe lower. I remember one professional brewer saying that the beer was probably stuffed. Yeast being “turned on and off” is not a good thing, by all accounts. So, these magical tiny organisms had not only survived, but produced some pretty good beer. Could I get them to make more? I looked up how to reuse yeast. And there are a few ways. The simplest is to pour new wort directly onto the yeast cake, once bottling of the last beer is done. This is a crude method as you’ve got all the dead yeast and left over hops as well. That not-good stuff is called trube. I say not-good because I haven’t come across anything yet that says it’s specifically bad for the beer. The next method is referred to as washing. Again, you need to get the yeast after bottling. But this time you don’t have to, and can’t, use it straight away. You’re suppose to pour in some pre-boiled then chilled to room temperature water into your fermentation vessel. Boiling is important because you want water without oxygen, or as little as possible, and the heat should kill anything bad. Then you want to chill because heat kills yeast. Once at temperature dissolve the whole lot in the water and pour into sanitised vessels. These should have some kind of air seal as you don’t want any more oxygen. Put in fridge and wait for the cloudy stuff to settle. At the end there should be clear-ish water/beer at the top, a thin white layer if yeast, then a thick bottom layer of tan/brown coloured trube. There’s a bit more to it, as I came to realise when I did that with the yeast from the Pseudo Lager. Long story short, I had to throw it all out. And that brings me to the last brew a couple Sundays ago (31 August). The Pale Trial Zwei was almost the exact same as Pale Ale Ein, but with Galaxy hops replacing the Victoria Secret hops. Gravity came in at 1.047, less than Pale Trial Ein. That’s somewhat expected a there was more water in this by the end to dilute the malt. And then pitched the wort onto the yeast cakes of Pale Trail Ein. So, this experiment is to see if this can work as a successful way to reuse yeast. 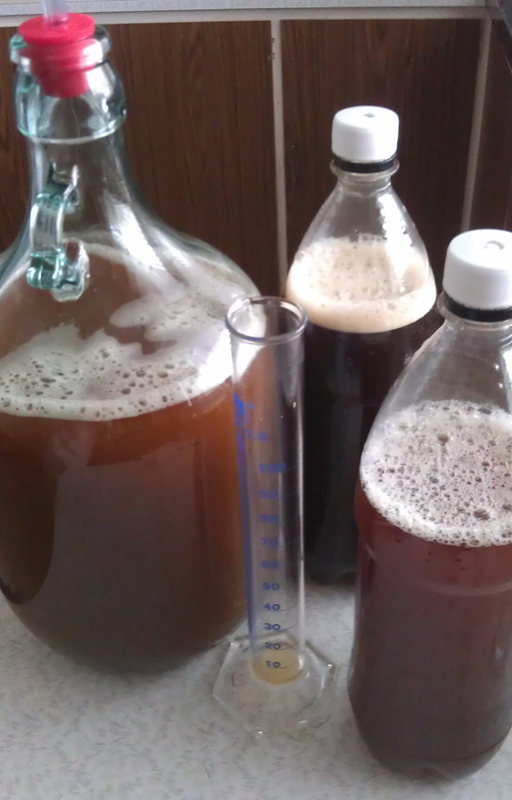 Plus want to see if yeast characteristics from one brew can carry over to the next. This second part is going to be the most interesting as the five Pale Trial Ein beers are different in colour and flavour. Bottling will be next weekend. Look forward to letting you know how it turned out. I mentioned last week about some home brew equipment I got from my dad. A pretty good hall of equipment, some ingredients and some print stuff. The equipment was filthy. The whole lot had been stored in the cellar. It’s really dusty down there. Over the years dust had built up, and caked on. Plus, it looked like there was sediment from the last wine made. And that was many years ago. This was going to be a tough cleaning job. Lucky a few weeks ago I picked up some Oxyper. It’s a strong cleaning agent. My mate Michael had recommended it to me as an alternative to PBW, a more well known powerful cleaning agent. Both are good for removing gunk and stuff from your brew equipment even when you let stuff dry on, everyone does it at some point. 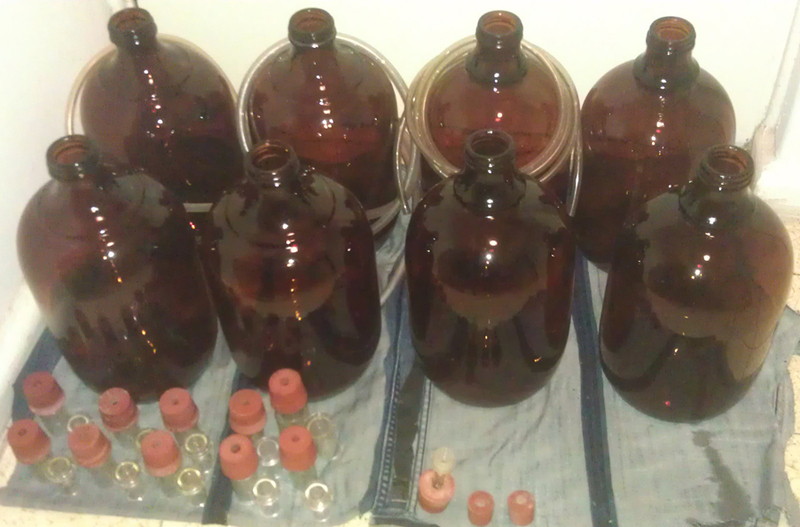 Clean carboys, tubes and airlocks with rubber bungs. Given the size of the carboys and amount of build up I wanted to soak as much as possible. That meant filling the laundry trough with 20 litres of water and 14 teaspoons of Oxyper. This wasn’t done one, or twice, but three times! The new bottling brushes came in quite handy. I was surprised with how much crud came out of the equipment. And, I was just as impressed on how clean I could get this stuff. 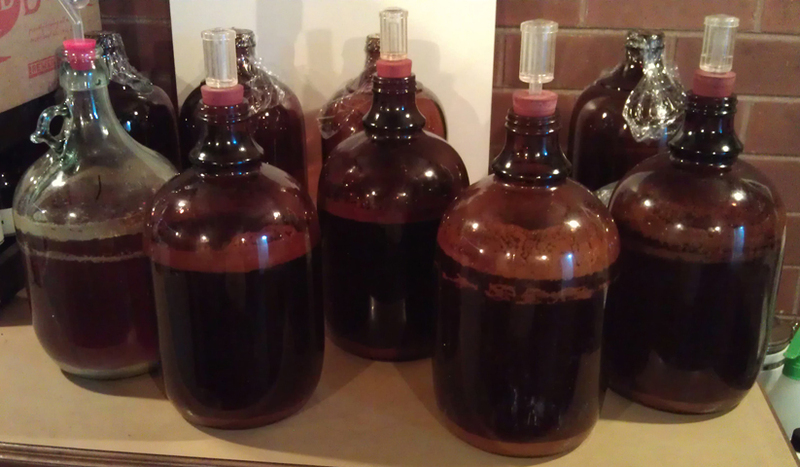 There’s no proper ‘before’ shot to compare to the clean carboys. The airlocks only had build-up on the rubber bung. Didn’t try to get the airlocks out of the bungs as I’m not sure how old it all really is. Plus I don’t want to break anything. The tubing was tricky. Tried a mixture of soaking and running water through. The two wider tubes were by far the dirtier ones. It all appears to have come up well. One exception is a dark mark in one tube which I can’t seam to be able to remove. I’m going to assume it’s fine. If it hasn’t come out yet it shouldn’t when I brew. And that’s a nice lead into the brewing I’ll be doing. But, that’s for another day. Sunday at my place was a very quick one. Only four litres of the Australian IPA #1 to be bottled. Plus sat down for a taste test of the Australian Pale #4. No brewing because in two weeks I’ll be on holidays. I don’t want to leave something in the fermenter too long. Will pick things up once I’m back. 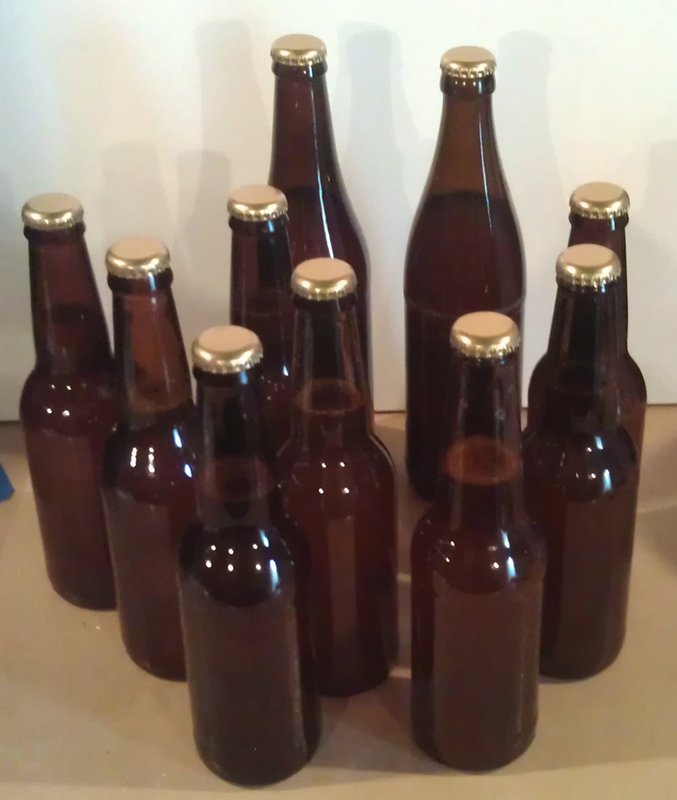 The bottling went very well with 13 stubbies sanitised, filled and capped super quick. The bulk priming works a treat. Getting the hang of tipping the priming vessel so you get the right angle to help liquid flow down the bottling wand. Gravity came in at 1.015. At first I was a little disappointed, then realised I had dry hopped (see the photo with the hop bag). Plus the original gravity was 1.058 which means after bottle conditioning I’m looking at about 6.1% alcohol. That’s good for the style. The sample we tried was very bitter. That’s somewhat expected for an IPA. I’m hoping the flavour and aroma comes out a bit more. I’ll sneak in a taste just before holidays, then we’ll do a proper tasting in about a month. As I mentioned, we did a proper tasting of Australian Pale Ale #4. Chas liked it and will write up a review soon-ish. Personally it’s my favourite pale ale I’ve made. And sits next to Baltic Porter #2 to battle it out as the best beer I’ve made. Not much left, might need to make some more once I’m back. Was very keen to get this write up done early. And now it’s Thursday. Oh well. Saturday was a funny sort of brew day. 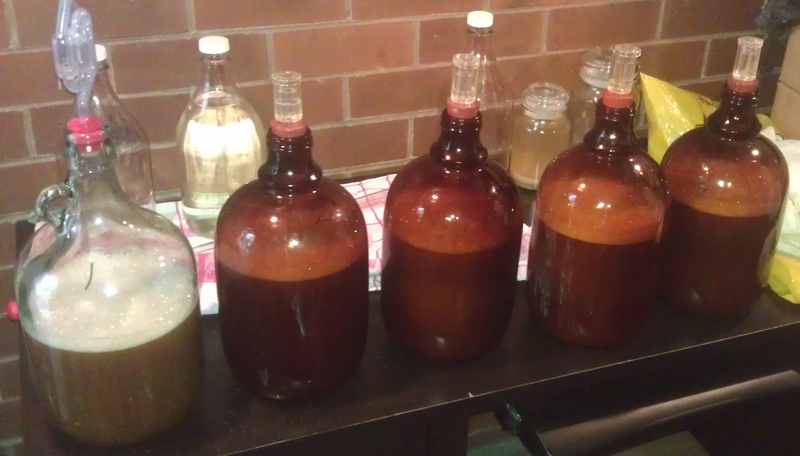 Had the Australia Pale Ale #4 to bottle and another 4 litre batch to produce. Then there were the not-beers, I’ll get to that later. Unfortunately there was no Chas. My good mate Ian stepped in again to help. That’s two brew days in a row, after not getting him over for the whole of last year! Before any brewing or bottling a supply run was required. I headed around to Ian’s place. Then, after a coffee and breakfast, we headed off to Grain and Grape in Yarraville. I’ve been wanting to go to Grain and Grape for a while. For home brewers in Melbourne it’s a sort of institution, party because they’ve been around for ages, partly because they’re dirt cheap, and partly because it’s a bit odd. The place is small. Really small. And packed to the brim with stuff. Lots of equipment. And quite a few odd characters both in front and behind the counter. My only piece of advice, don’t go on Saturday unless you absolutely have to. It’s packed on Saturdays. After leaving Grain and Grape we dropped some stuff at Ian’s place. Then I realised I didn’t pick up any speciality grains. So we went to Cellar Plus. It’s just north of the Vic Market. A lot more laid back place than Grain and Grape. Staff don’t know much about home brewing and the range isn’t the best. But you can pick up essential supplied, like the Crystal grain I was after. Once done with supplies it was back to my place. First order of business was working out what to brew. Yep, left this one a bit late. Brew for the day was going to be one of three options; the next pale ale, an amber ale or an IPA. Ian was a last minute ‘yes’ to help out. If he was coming it would be something a bit more complex. If he wasn’t it was going to be something very basic. So, as Ian was there to help I decided on doing an IPA with Crystal grains. Had a look in the freezer and knew I had a lot of different hops. After playing around Kit & Extract Beer Designer spreadsheet I came up with an IPA recipe. Decided on a mixture with Warrior for bitterness then Aramilo, Citra and Simco. I’ve never used the last three and looking forward to tasting these. So, here we have the Australian IPA #1. The steeping grains was the first order of business. Into a grain bag. Then Ian crushed them by rolling them with a rolling pin. Brought two litres of water to a bit over 70°C and chucked in the grain bag. Then we left it to go bottle. 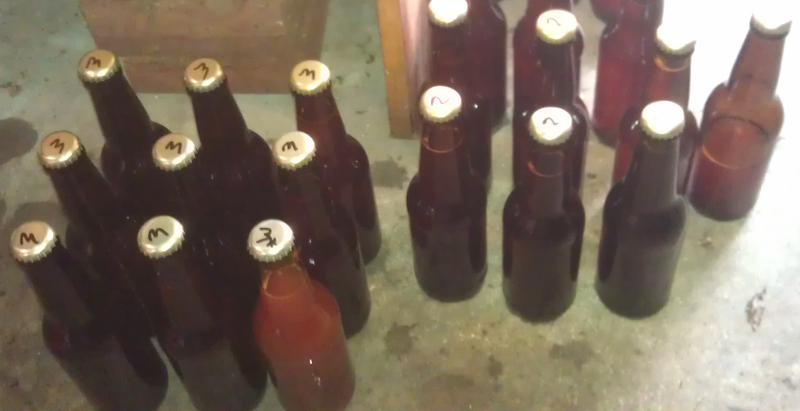 Australian Pale Ale #4 all bottled. Bottling the pale ale was straight forward. Another bulk priming job from carboy to the small fermenter with sugar then using the tap to bottle. Nearly got this process down pat. The gravity for the Australia Pale Ale #4 came in at 1.011. I was expecting a low reading if the original reading was right. But it came in a bit too high. I’m even more convinced that the original reading was wrong. Anyway, from the readings I have this should be 4.0% after bottling. It had a very pronounced grapefruit bitterness and dryness. Going to be interesting to see how this one turns out. Once bottling was done it was back to the brew kitchen. The grains had sat for more than the thirty minutes, but that didn’t matter. An extra litre if water went in and we brought it up to a boil. About a third of the dry malt went in. After the hot break the fist hops. Next hops 15 mins later. Rest of malt went in with 5 mins to go. Then final hops at flame out. Not trying the “no flavour hops” method, yet. Chilling went very well. The two litres of half frozen ice and just over half a tray of ice cubes went straight into the pot. The pot also sat in the ice bath to help further. When it came to getting the wort into the carboy I tried something extra. Used a muslin bag for extra filtering. Put this at the bottom of the funnel. So, pot into sieve on funnel in muslin bag in carboy. Should have got a photo. 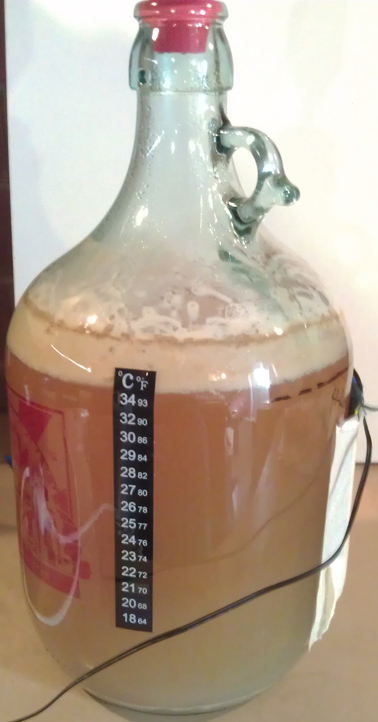 Shook up the carboy before taking a gravity reading. Was a respectable 1.058, just shy of target. 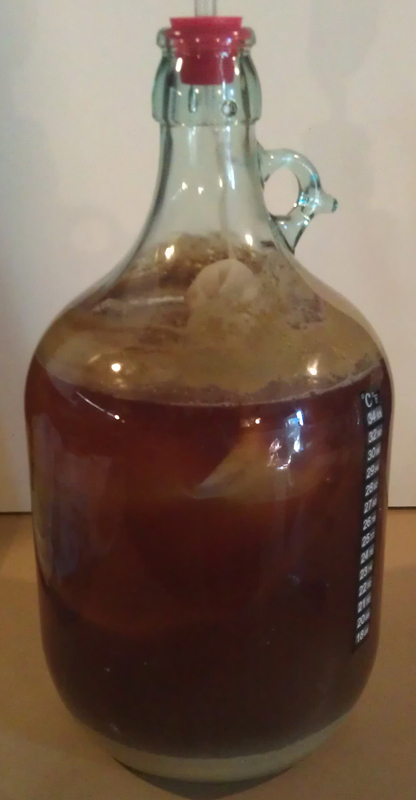 Yeast was pitched, yeast nutrient put in, carboy given another shake, and airlock put on. First brew done. Onto the non-beers! Let me give you some context. My wife loves malty beers and doesn’t like hoppy beers. The question was raised “could you make a beer without hops?” Well, you could technically make a brew without hops. Not sure if you would still call it a beer. Not sure if it would taste any good. Anyway, I decided to make two very small batches of no hop beer. The first batch was with dry amber malt extract. Very easy. Boil water. Chuck in malt. Bring it to a hot break. Heat off. Cool in an ice bath. Put in fermentation vessel. Pitch yeast. Add yeast nutrient. Shake. Seal with airlock. Done. Second batch was done with dry dark malt extract. Both were about 1.2 litres. Both went into soft drink bottles with Pat Mack’s Home Brewing Caps. Perfect set up for these super small experiments. After fermentation I’ll put these in glass bottles to condition. After three days I went back to the Australian IPA. Time to dry hop. Was planning a 4 grams addition of Amarillo and Citra with a 50/50 split . Worked out a lot closer to 4 grams Amarillo and 3 grams Citra. Whoops. Hope that’s not too much. Ah well, I can just leave it a month to settle before drinking a bottle. Was quite a good day. Great to have Ian around again. Glad to do a brew with some grains again. And happy to get the not-beers fermenting, even if I’m dreading what they’ll taste like. Talking of taste, the wort for the IPA was very hoppy and undrinkable. Good a sign. Will let you know how that one develops. Enough feeling sorry for myself, time to brew. Back on Saturday 9th we had a brew day at my place. It was a huge fun day, even if the brew we made was only four litres. I finally managed to get my good mate Ian around for a brew day. Chas made it and my friend Michael was able to join us as well, which made four on the day. More than needed to bottle the cider and the new brew. So, plenty of mucking around was had. First order of business was bottling the Sneaky Cider. Was another bulk priming job, I don’t think I’ll go back to individual bottle priming. Cider from carboy into the small fermenter with the sugar. Then bottled straight from there. I decided to continue my experiments with soft drink bottles. We filled two 1.25L bottles and the rest filled six stubbies. Gravity came in at 1.004 which I’m really happy about. Was trying to keep the sweetness low on this. Bulk priming was done with possibly a bit too much sugar, will see. End result should be a cider of 7.8-7.9%. That’s a big kick for such little effort. Nice. Onto the beer. Due to the mess that is Melbourne weather, I wanted to make sure this brew could be kept cool like the cider. That meant another small batch in the carboy. So, picking up from where I left off it was time for another Australian Pale Ale experiment. A bit of a side note, I’ve been a little obsessed the last six months or longer with a new Australian hop variety. It’s called Vic Secret (or Victoria Secret, depending on who you ask) and first time I had it in a beer I was blown away. This popped up back in 2012 in a collaboration beer simple called Victoria’s Secret by Beer Here and Northdown (now Edge). A single hop beer. I only had one bottle and really liked it. The beer has just been re-released under the Edge name, with a slight tweak to the recipe. Since then there have been a few other breweries bring out beers with this new hop type. Anyway, I have been trying to get my hands on this stuff so I can make a single hop beer. It’s been very hard to find with a lot of home brew shops not even aware it exists. Then finally a friend found a place that has some. And now I have some. Australian Pale Ale #4 is a single hop beer. That hop is Vic Secret. The hop is quite high on alpha acid, the bitterness. I was using the same base, light dry malt extract, as I did for the last two Australian Pale Ales. Hop additions were done at 30 mins, 15 mins and 1 min. Nice and simple. Michael suggested that the middle hop addition isn’t needed. He’s been doing a fair bit of research into brewing, does a bit of home brewing and has been helping out at some breweries. The idea behind not doing the mid point hop addition is that you’re not really adding any flavour. You can get this from the last hop addition. And you get more bitterness from the first addition. Or that’s the theory. Might give it a go. Expect a post dedicated to this, at some point in the next few months. Chilling was a quick one. Having these small batches makes it a lot easier. This time there was a lot going on. Two trays of ice and an ice cream container of half frozen water went straight in. 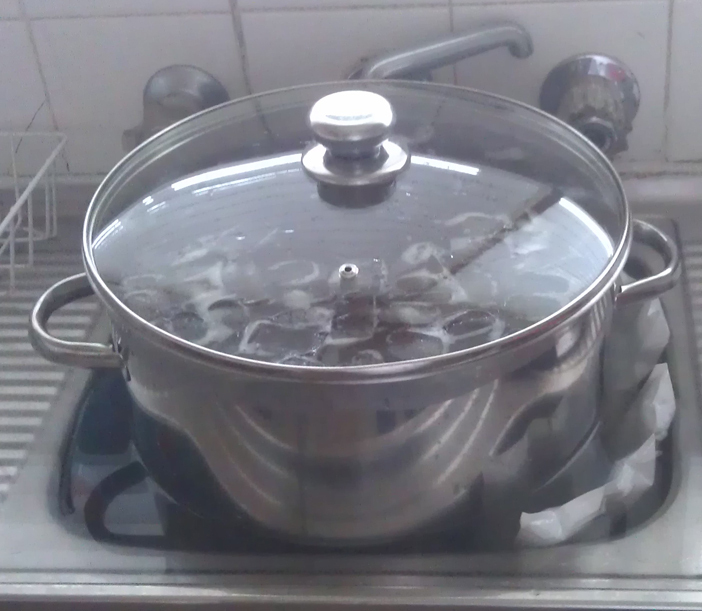 The pot sat in it’s bath to chill with ice packs. 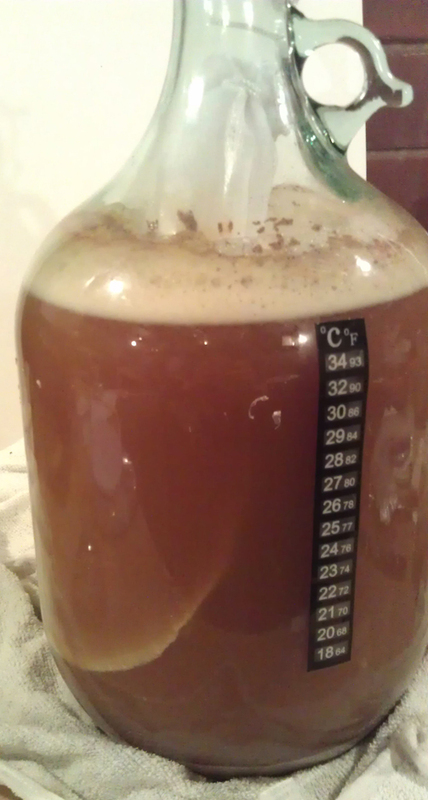 Gravity came out at 1.038. Was originally disappointed. There’s a good chance that the sample taken for the reading wasn’t the best. After pouring the wort liquid into the carboy I top it off with water. You’re suppose to shake it before taking a sample so you get something mixed. This wasn’t done. Comparing it to both Australian Pale Ale #2 (1.044) and #3 (1.046), this was low. To put that in a bit if context, the difference of 0.008 in gravity is approximately equal to 1% alcohol. That alcohol helps give the beer a better body. Hope #4 turns out fine. Like the last few brews the yeast was rehydrated. Somewhere around 1-2 cups of boiled water was put in a glass jug, covered and left to cool. Not sure what it got down to, maybe as low as 25°C. Then a teaspoon of yeast was put in. And to speed things up a teaspoon of the dry malt was also put in. That’s a very small yeast starter. 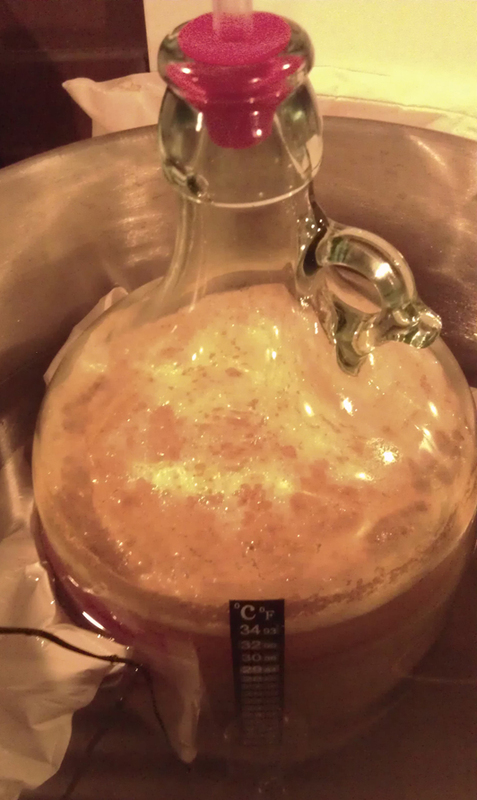 By the time it went into the carboy there was already a bit of a krausen, yeast head. Yeast in, airlock on, carboy into the big pot of water. Done. This was a really fun day. Great company, lots of drinks (review of the Iron Curtain Imperial Red Ale within the week), BBQ chicken for lunch, some really dodgy music, and not a tricky brew. Hoping there’s a lot more days like this in the future. And I’ll be bottling tomorrow. Exciting. Sunday was brew day at my place again. Yay! I’m enjoying the small batches and this was another one. First up was bottling the Australian Wattle Pale Ale. Got pretty carried away and nearly forgot to take a sample for the final gravity. Was happy with the final reading of 1.014 which means it will be 4.2% ABV after conditioning in the bottles. The sample for gravity was also our sample. Have to say it was very rough and bitter. Might need more than the regular two weeks conditioning. Worth nothing that this was the first beer that I’ve had proper temperature control. The sensor was attached and set at 22°C. There is one degree buffer range on the sensor. This meant brewing temperature was kept between 21.0°C and 22.5°C. That top range estimate as I wasn’t constantly checking. I wasn’t even checking that often. Anyway, point is that there was some control on this fermentation. After all the bottling was done it was time for the next brew. This time it was a return to the BrewSmith Hoppy Heart IPA. I quite liked the last batch and wanted another lighter flavoured beer before trying the Baltic Porter again. 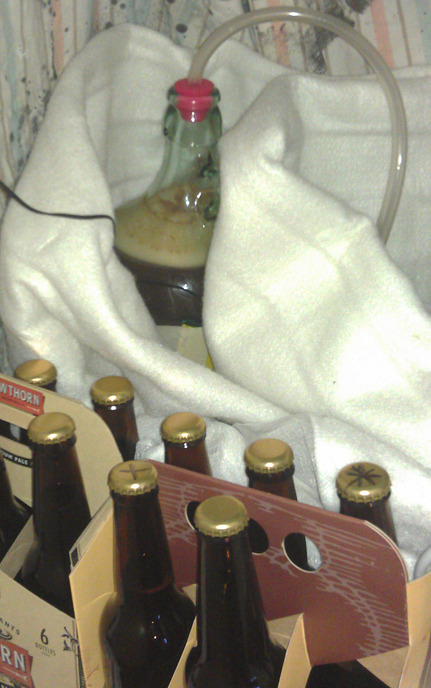 Hoppy Heart IPA in carboy in blanket and Aussie Wattle Pale Ale in bottles. Had fun with this brew. Read the instructions before starting, after the mess that was the Pale Ale. The kit was straight forward and everything went to plan. Did a couple extra things. For the steeped grains did a sparge to rinse out more flavour, colour and sugars. Thus gave a slightly darker beer but should be more flavour. Also played around with the cold break. Used two 1.25L bottles with frozen water as ice blocks to cool the original water. This worked well. Also added about a litre of chilled water direct to the wort. After ten minutes changed over the water. As part of this I poured the near-frozen water into the sink for the bath, and topping up the bottles with tap water to continue the chilling effect. The wort wasn’t chilled enough enough after another 10 minutes. So a third bath was required. It was only now that I realised there were two trays if ice specifically prepared. They were thrown in. As a result the temperature dropped too much and there was too much wort. The wort only just fit into the carboy. A lot of shaking later, for oxygenation, we took a sample for gravity. It came in at 1.064 which is quite alright. 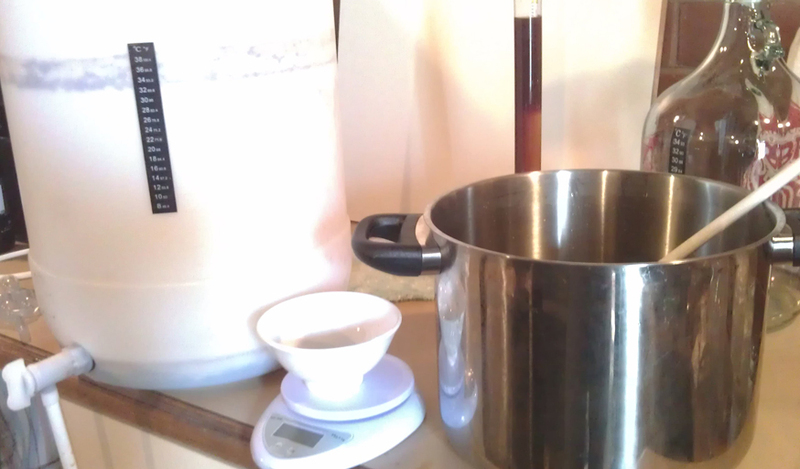 Yeast was pitched and put away with temperature set at 21°C. So, should ferment at 20° to 21.5°. The day went well. Bottling and brewing on the smaller scale if things is nice. Plus return to a nice beer that was chilled, and will be fermented, cooler than before.